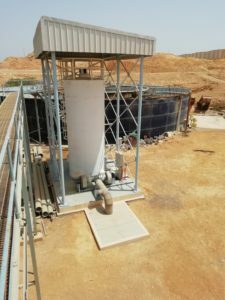 In search for the most sustainable techniques, IPEC has developed a biotrickling filter (BTF) to remove odorous smell without the use of chemicals. In the BTF, the required conditions (moisture, nutrients, …) are created to allow bacteria to grow on the media inside the vessel. The biotrickling technique is mainly developed to remove H2S and VOC from sewage applications. In case of hydrogen sulphide which is the major component to be removed from foul air from a sewage network, the autotrophic bacteria will oxidize H2S into sulphuric acid which is drained to the network. The VOC components will be oxidized by heterotrophic bacteria (upstream in the BTF), present at a higher pH. The proper design and selection of the correct media will result in a low pressure drop and less energy consumption. To moisten the bacteria and to drain the sulphuric acid, TSE (treated secondary effluent) can be used. This water may still contain some nutrients (NPK) which is beneficial for the bacteria culture in the biotrickling filter. If potable water is supplied, additional nutrients can be dosed through a dosing system.